Approximately 22 x 28cm. 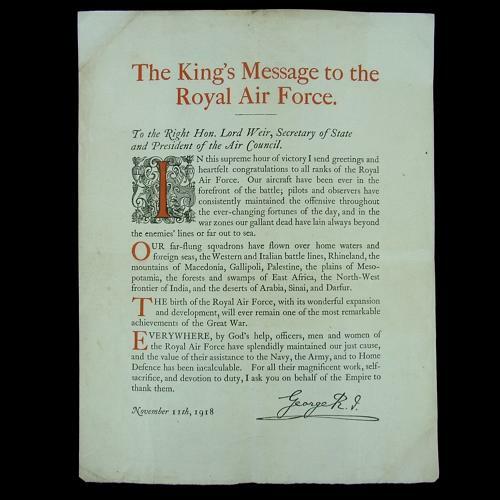 'The King's Message to the Royal Air Force' produced for Armistice Day, 11th November 1918. 'In this supreme hour of victory I send greetings to all ranks of the Royal Air Force. Our aircraft have been ever in the forefront of the battle; pilots and observers have consistently maintained the offensive throughout the ever-changing fortunes of the day, and in the war zones our gallant dead have lain always beyond the enemies lines or far out to sea... The birth of the Royal Air Force, with its wonderful expansion and development, will ever remain one of the most remarkable achievements of the Great War...' Printed on thick watermarked paper. Has been folded, is lightly stained, creased and has dog-eared corners. Nevertheless a remarkably rare document. At 100 years old this is now a genuine antique. Stock code P16836.